Sharas is a djane from Barcelona (Spain). Since a very early age she has been interested in different styles of electronic music and began mixing techno in the early 2000s. 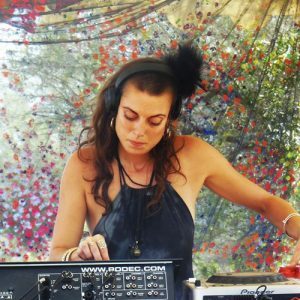 Soon, she got introduced in the psychedelic scene, specially during her years in the UK, until she discovered her passion for the forest sounds. Since 2008 she has been mixing forest and spreading her sounds in underground parties in Spain. In 2011 she became part of Amaya Productions, organizing parties in Berlin until 2014, when she signed for Vantara Vichitra as a label DJ. She has played in festivals and parties in Spain, Germany, Norway and Portugal. Her sets are characterized by bubbling sounds, crazy atmospheres and deep basslines that will take you on a journey in the deepness of the forest.